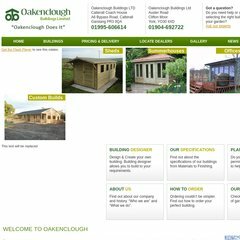 Topics: Oakenclough, Buildings, Sheds, Budget Sheds, and Offices. The programming language environment is PHP/5.3.16. There are 2 Nameservers, ns1.designed2perform.co.uk, and ns2.designed2perform.co.uk. It is hosted by United Hosting Ipv4 Assignment (England, Hempstead,) using Apache/2 web server. PING (83.223.124.6) 56(84) bytes of data.